The restaurant parking valet handed me the keys to a Toyota. “I’m driving a Lexus” said I. He looked at me in puzzlement. “Oh yeah, my Toyota Avalon just feels like a Lexus”, I responded. I got to experience the new Avalon in its Hybrid guise finished in Limited trim with a base price of $42,800. The Hybrid also comes in XLE and XSE trims. A V6 Avalon is offered in the same three trims plus a Touring trim. Base prices range from $35,500 to the $42,800 for the Limited Hybrid. 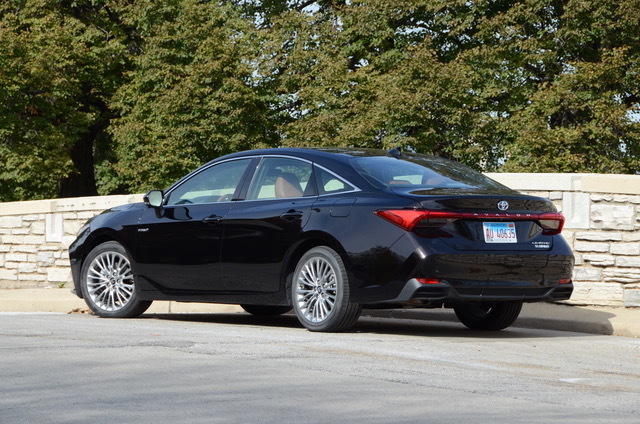 The new Avalon is longer, lower and wider…not unlike many newly redesigned vehicles today. New body panel stamping methods allow for a more chiseled and sporty look. Overhangs are reduced and cowl and rear deck heights have been lowered. 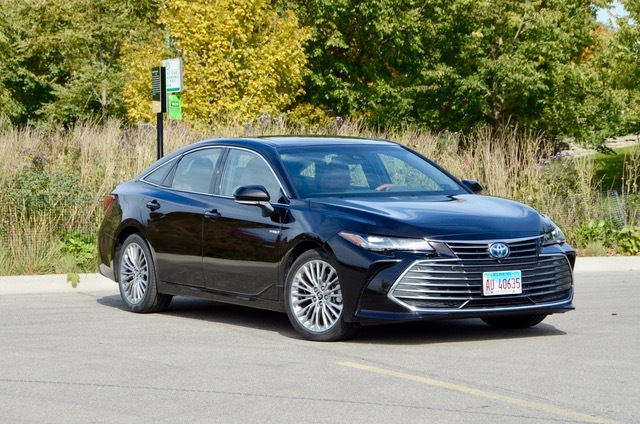 From the wide, new grille, slim LED headlamps with long, side character lines connecting to new LED taillights, the Avalon makes a somewhat more aggressive while yet luxurious statement. I do like the outside design of the Avalon, especially in its black-appearing, new Opulent Amber paint. However, my “Lexus mindset” comes from the looks of the cabin. 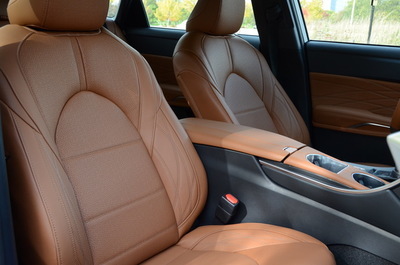 The new-for-2019 Cognac colored leather-surfaces set off the dark exterior quite well. Soft-touch materials, wood and aluminum bits, accent arm rests, the center console with piano black trim all make for a luxurious look. The Avalon has plenty of front seat room with easy ingress and egress. Clear sight lines and not-too-thick A-pillars make for good outward view. I’ve come to like the higher mounted multi-media display screens of today but still like real knobs for audio system control. There is now Apple CarPlay in Toyota’s Entune system. Rear seat legroom is up as a result of Avalon’s increased length. Standard on all Avalon models is a complete line-up of driver assistance safety features. These include blind-spot monitoring, rear cross-traffic alert, automative forward emergency braking with pedestrian detection, lane departure warning, lane keep assist, adaptive cruise control and high beam assist. 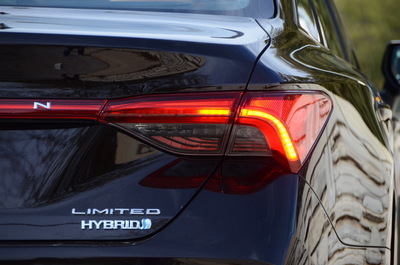 Optionally equipped on my Limited Hybrid was the $1,150 advanced safety package that includes intelligent clearance sonar, bird’s eye view camera and emergency braking feature for rear cross traffic alert. In my drive of the Avalon these features worked as I would expect although the emergency braking on the rear cross traffic alert was a bit too sensitive and slammed on the brakes a couple times in maneuvering situations when it detected an approaching vehicle. This is an example of the refinement that still has to come with semi-autonomous technology. The front-wheel drive Avalon’s hybrid drive has a net 215-horsepower with its 2.5-four-cylinder mated with a 650-volt electric motor and a Continuously-Variable Transmission (CVT). Avalon hybrid continues to be the only full hybrid vehicle in the segment. EPA test cycle ratings are 43 mpg across the board (city/highway/combined) with hybrids yielding the best improvement in city-type driving. The other engine choice is a 301-horsepower, 3.5-liter V6 matched to an all-new 8-speed Direct Shift-8AT automatic transaxle driving the front wheels. EPA test-cycle ratings are 25 mpg combined, with 22 city mpg and 31 highway mpg. With the hybrid priced $1,000 more than the V6, which is fairly reasonable, the decision comes down to whether you want (or need) more performance or lower fuel consumption. I thought the Avalon Hybrid drove quite well around my Chicago environs and didn’t see any lacking in performance. However, if you live in hill-country or drive often with a full-load of passengers the V6 might be the better choice. At just a touch under 196 inches long and with its 16 cu.ft. trunk the Avalon makes for a fairly decently sized car even for city use. Certainly maneuvering is helped tremendously by all the park sensors and birds eye camera. The ride is comfortable while also at the same time handling is a bit sporty when pushed. And on the inside all things are nice and quiet. Unless you live in serious snow country I don’t consider the lack of an all-wheel drive option to be a detriment. My choice would be to equip a set of four winter tires to help get through a Chicago winter. 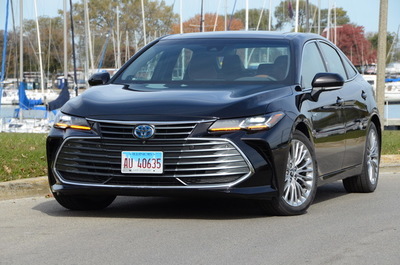 More details on the 2019 Toyota Avalon can be found at www.toyota.com. Noteworthy is that the Avalon comes with ToyotaCare, a complimentary maintenance plan for 2 years or 25,000 miles. Social gathering conversation about what car you drive may not raise many eyebrows when you respond, Toyota. On the flip side, the not-too-ostentatious nameplate might just be the right choice for an understated and smart-choice image in your neighborhood. Although, the Avalon does turn some heads and the interior appointments say luxury. The Most In-Depth Toyota Vehicle Consumer Research - Anywhere!